It was almost 2 years ago when I looked out of the window of my old apartment and watched Donald Trump's hair flap in the wind as he oversaw the first breaking of the ground on a site that will become in 2009 the Trump International Hotel and Tower. The first 14 floors already stand tall on the north side of the river and it is hard to imagine how enormous it will look when the scaffolding finally climbs to it's intended top floor, the 96th. The design of the building takes in to account it's neighbours with three separate height setbacks to match The Wrigley Building, the Marina City Towers and the Blackstone Group's 330 North Wabash St. 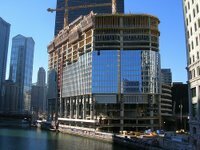 The building will break the world record for the tallest residence in the world (currently held by Chicago's John Hancock Center) and if you are interested they are available for between $470,000 and $1,8m + $150,000 for a parking space but you have missed out on the 14,000 sq ft top floor penthouse, old Trumpy has reserved that for himself. Meanwhile the planned twisted Santiago Calatrava designed 'drill bit' building will now not be so twisted. Initially plans to build the tallest building in the world included a hotel and retail space but the new design will be completely apartments (all 3m sq ft of space) and where it originally twisted 360 degrees, it will only do a 270 as it makes its way to the top of its 2,000 foot height.